It’s been a while since the last time I had homemade crackers. The problem is whenever I bake crackers, they don’t seem to last past 2 days. Okay fine, I may have exagerrated. This is not really a problem. 😉 I am blessed that my beloved enjoys the stuff I made. It’s always a bad sign when homemade bakegoods are left unattended for more than a week. This could only mean one thing – questionable baking skill ha! For me baking has to be as simple as possible. I think I am a better cook than a baker. But I like the idea of me being a good baker too. I hope that these crackers will make me look like a semi-decent baker. 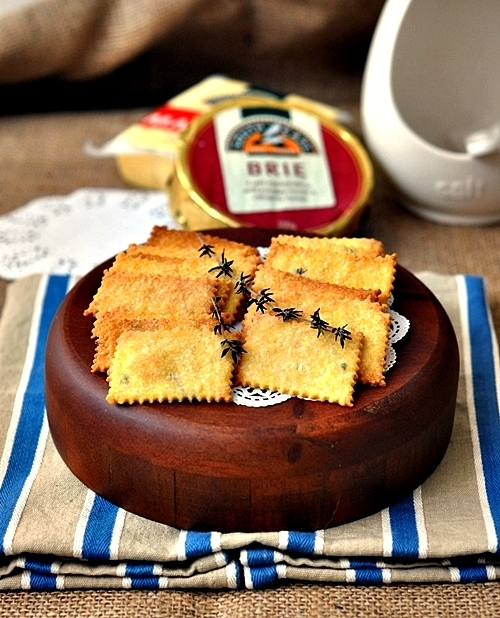 These crackers are quite easy to make. No food processor is required. Just a humble fork…and a grater if you decide to grate the parmesan cheese yourself. 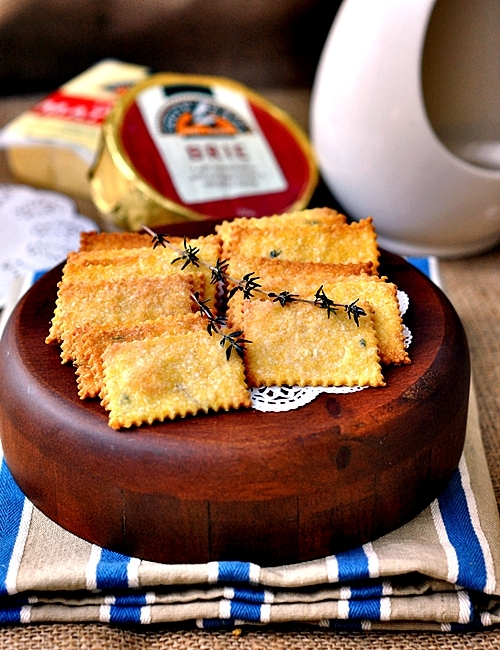 *I omitted salt from the recipe as I wanted to pair these crackers with brie which is already salty. Instead of adding salt in the dough, you can sprinkle the salt after they are done. (1) Add flour, polenta, parmesan, thyme leaves and salt (if using) into a mixing bowl. Add the olive oil and stir the mixture until resembles fine breadcrumbs with a fork. Slowly stir in water until it is fully incorporated to form a slightly sticky dough. (2) Turn the mixture out on a clean work surface and knead the dough gently to gather into a smooth ball. Add water if the dough feels too dry to form a dough or add more flour while kneading until the dough is smooth, pliable and does not feel sticky. (3) Depending on the size of your work surface, divide the dough according to your liking (I divided the dough into 2 smaller doughs). (4) Use a rolling pin and flatten the dough as thinly as possible. 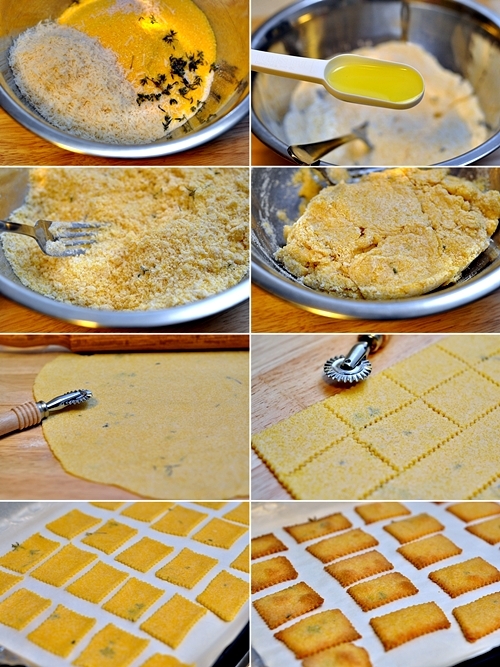 Then use a pasta cutter (or regular knife) to cut into squares or rectangles. (5) Transfer them to a baking paper lined tray and bake for 7 to 10 minutes or until they are golden brown in a preheated oven of 200 degrees C/392 degrees F. (6) Cool on a rack before storing in an airtight container. I luv these crackers. There’s a rusticness about it and I like how perfect you made them look. Mmm…what a great combination of ingredients and flavors. A must try for me, for sure! oh god they look good! I ran straight to the pantry, but I’ve only got about 20g of polenta…boo! It’s on the shopping list now. 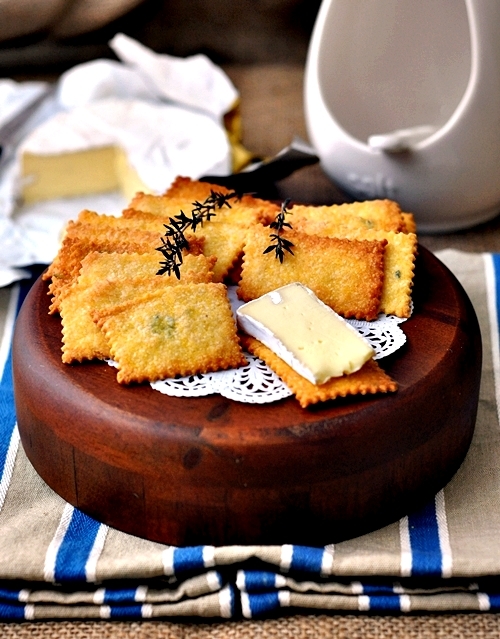 This look fantastic…I much prefer savoury crackers to sweet biscuits, but I’ve never attempted a savoury thing like this before….my baking skills are rather woeful.